The RCA Dome (originally Hoosier Dome) was a domed stadium, located in Indianapolis. It was the home of the Indianapolis Colts NFL franchise for 24 seasons (1984–2007). It was completed at a cost of $77.5 million, as part of the Indiana Convention Center, with the costs split between private and public money. The largest crowd to attend an event at the dome was 62,167 for WrestleMania VIII in 1992. It was demolished in December 2008, as part of a project to expand the attached convention center. The dome itself was made up of teflon-coated fiberglass and weighed 257 short tons (229 long tons; 233 t), which was held up by the air pressure inside the building. The ceiling was 193 feet (59 m) high, though the height varied up to five feet as the materials expanded and contracted with the weather. As was the case with other domes of this style (the Hubert H. Humphrey Metrodome, BC Place, the Carrier Dome, and the Silverdome) there were warning signs posted cautioning patrons of the high winds at the doors when exiting. The domed stadium was similar in design and appearance to the Metrodome and the previous BC Place roof, owing in great part to the involvement of engineers David Geiger and Walter Bird, pioneers in air-supported roofs. The stadium was originally named the Hoosier Dome until 1994 when RCA paid $10 million for the naming rights for 10 years, with two 5-year options to RCA at a cost of $3.5 million if invoked. The stadium seated 56,127 for football, the smallest in the NFL. Modifications were made to the stadium in 1999 to expand the suites and add club seating. Before that, the maximum seating for a football crowd was 60,272. 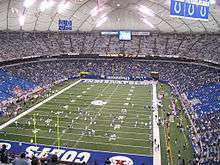 The Dome was officially dedicated on August 11, 1984, as a sellout crowd watched the Indianapolis Colts defeat the NY Giants in an NFL preseason game. The Buffalo Bills and Chicago Bears played a preseason game at the Hoosier Dome on August 26, 1984. The game had been scheduled prior to the Colts moving to Indianapolis. The stadium also hosted high-school football games. In 1991, the Dome hosted the 1991 World Artistic Gymnastics Championships. In 1992, the Dome hosted WrestleMania VIII for the World Wrestling Federation. Basketball was also played at the RCA Dome. The first game played there was an exhibition game in 1984 between an NBA All-Star team led by home-state hero Larry Bird and the United States Olympic Men's Basketball team, coached by Bob Knight, who was at the time the coach of Indiana University. The Dome also served as the site of the NBA All-Star Game in February 1985, where a record NBA crowd of 43,146 saw the Western Conference beat the Eastern Conference 140–129. Since then it hosted many NCAA Men's Division I Basketball Championship games, including four Final Fours (1991, 1997, 2000, 2006). The NCAA, whose headquarters are in Indianapolis, has committed to holding the Final Four in Indianapolis once every five years. The RCA Dome hosted its only Women's Final Four in 2005. The closing ceremony and the gymnastics and handball events of the 1987 Pan American Games were held in the Hoosier Dome. In addition, it hosted the NCAA Men's Division I Indoor Track and Field Championships from 1989 to 1999, the 1990 General Conference Session of Seventh-day Adventists, the World Gymnastics Championships in 1991, the Indiana High School Athletic Association's annual boys and girls championships (with the boys' final game witnessed by the largest crowd [over 40,000] ever for a high school basketball game), and served as one of two sites for the FIBA Men's World Basketball Championship Tournament in 2002, sharing the honors with Conseco Fieldhouse, the home of the Indiana Pacers. Additionally, the RCA Dome served as the site of the Indiana State School Music Association State Marching Band Competition, the Bands of America Grand Nationals, and the Drum Corps International Midwestern Regional, along with the NFL Scouting Combine in February of each year. It also hosted a PBR Built Ford Tough Series bull riding event in 2004. The Dome hosted an AMA Supercross Championship round from 1992 to 2008. Many memorable concerts took place in the "Hoosier Dome" such as Farm Aid in 1990 (Elton John, Guns N' Roses, Lou Reed, John Mellencamp, CSN&Y, Willie Nelson, Iggy Pop, Don Henley & Bonnie Raitt to name a few), Monsters of Rock (Van Halen, Metallica, Scorpions, etc. ), 1987 Pink Floyd reunion, Rolling Stones, The Monsters of Rock Festival and Farm Aid 5. It also hosted events such as Black Expo, Promise Keepers, truck pulls, wrestling and many high school events. The football playing surface was originally AstroTurf; it was replaced with FieldTurf in 2005. The stadium was replaced by a new retractable-roof stadium, Lucas Oil Stadium, in time for the 2008 NFL season. The RCA Dome was replaced by additional space for the adjacent Indiana Convention Center. The new convention space connects to Lucas Oil Stadium in much the same way that the existing Indiana Convention Center had been connected to the RCA Dome (although the new connecting walkway now passes under a railroad track). On September 24, 2008, the roof of the Dome was deflated, which took about 45 minutes. The demolition of the RCA Dome was featured on the second series premiere of the National Geographic show, Blowdown. An Indianapolis nonprofit, People for Urban Progress, rescued 13 acres of the Dome roof. They work with local Indianapolis designers to upcycle the material into community shade structures and art installations, as well as wallets, purses and bags. Wikimedia Commons has media related to RCA Dome.